Luxurious accommodation, epic views to sea to maximise on the instant ‘ahhhhhh’ relaxation factor, stunning countryside surroundings – tick, tick and tick! 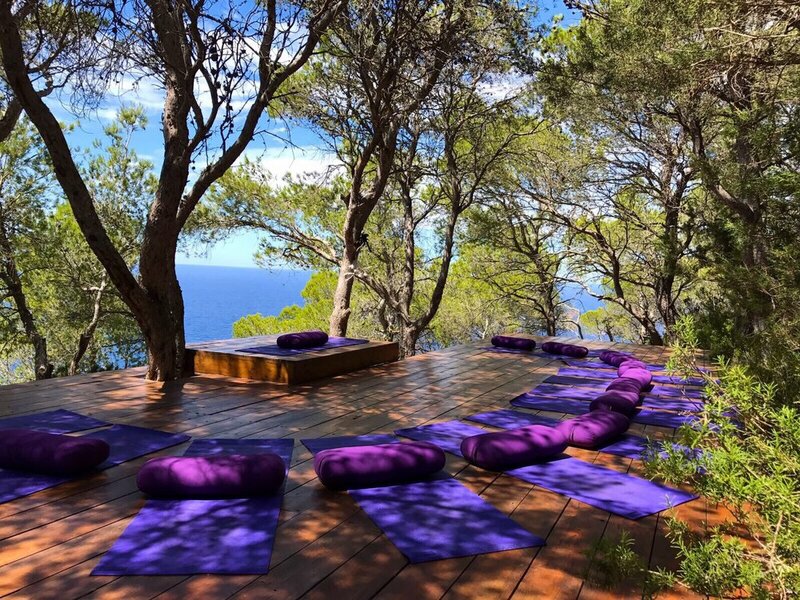 And that’s in addition to epic sunsets over the sea, a stunning yoga deck nestled into pine trees AND looking out to sea and perhaps my fave, a jaw-droppingly beautiful and secluded beach a 35-minute trek along a rugged path through pine trees. When I took my first wander down to the beach I felt quite overwhelmed by the beauty of it. It’s the best of Ibiza and simply divine and I truly think that you will love it. What do the retreats include? Wake up to a daily dynamic Yoga, Mindfulness & Journalling practices lead by experienced, soulful and amazing yoga teachers. Enjoy multiple workshops and talks with subjects ranging from Nutrition, Life-Coaching, Cooking Classes, Ayurveda, Meditation, Pranayama, Yoga Nidra & Yoga for Insomnia. For beginners we have a Beginner Yogi Clinic, working on the introduction to key poses. For the more advanced, our specialist teachers can work on anything specific, for example, perfecting the perfect new pose or going deeper into your practice. Our goal is to utterly pamper and care for you during your Soulshine Retreat, so that you don’t need to think about a thing other than relaxing and enjoying yourself. Expect to be utterly pampered by the Soulshine Retreat hosts and extensive Soulshine Wellness Team, comprised of handpicked expert Yoga teachers, Meditation guides, Ayurvedic & Nutritional experts and body soothing massage therapists - all sharing one intention - to spoil you rotten. Plus, our retreats include a personal assessment with our Soulshine Team to recommend a bespoke Wellness schedule. All dairy-free, gluten-free, vegetarian and healthy food is included and prepared by team of professional private chefs. Simply divine! Your retreat includes the choice of a 1:1 Life-Coaching, Yoga or Mindfulness Session with Soulshine Founder, Soulla or a personal massage treatment with one of our expert therapists. Plus a 30-minute optional follow up call a month after your retreat with Soulla to check in on those healthy goals! 6 nights in stunning luxury Ibizan accommodation with our onsite Soulshine Hosts and Holistic Wellness Team, plus a wonderfully small group to ensure maximum pampering and attention. If you're thinking about booking this, please please do. Thank you so much for such a relaxing, indulgent, gorgeous week. Yes, the villa and the food and the island and the weather are amazing but this place is special due to the care and warmth that each member of the team here bring from the moment you arrive to saying goodbye. You'll certainly see me again! I just returned from my second Soulshine experience which totally exceeded my expectations again! What an amazing week of blissful dynamic and restorative yoga, delicious food, beautiful accommodation, fantastic company and lots of fun and laughter. It doesn't stop, from the minute you arrive you are transported to a lovely place full of peace, tranquility lots of laughs, fantastic yoga, wonderful massage and great workshops. So much attention to detail to make each and every one of us feel special. I guarantee you will not regret it, it will probably be one of the best decisions you will make for yourself. Enjoy !